Out of the Auditary is a new, hopefully recurring fest for podficcing works that don't fit into the "standard" fiction format, such as meta, not!fic, epistolary and chatfic, video game codes entries, fake scientific articles, poetry, and many more! Rules and details are here on AO3; submission deadline is March 23rd! <a style="font-weight:bold" href="https://archiveofourown.org/collections/OutOfTheAuditary2019/profile"><img src="http://sylvaine.parakaproductions.com/outoftheauditary/ootabanner.png" alt="out of the auditary promo banner" /> Out of the Auditary</a>: a fest for podficcing works that don't fit into the "standard" fiction format, such as meta, not!fic, epistolary and chatfic, video game codes entries, fake scientific articles, poetry, and many more! It's time for year N I N E of the Ladies Podfic Anthology! As before, we'll be collecting short lady-centric podfics by different readers in different fandoms to release as an anthology and as a collection of individual files. The submission deadline is February 14th, and we will post on February 28th. The theme for this year's anthology is laughter. It's optional—all podfics are welcome as long as they follow the rules laid out in the Submission Guidelines—but feel free to let it inspire you if you'd like. If you are not familiar with this project, you can see the previous eight anthologies here, here, here, here, here, here, here, and here. Important note: Please make sure you read and follow the Submission Guidelines below the cut. It helps everything flow together much better, and it makes the mods' jobs so much easier! To Podficcers: Interested in participating? We'd love to have you. This should be a low-stress project, even for people who are new to podficcing, due to the word-count: 1500 words or less (with many being as short as 1-2 minutes). If you'd like to record something for this anthology, please fill out this quick google form and we'll send you the link to the spreadsheet where we'll be keeping track of all the podfics. -The Women Being Awesome, Female Characters, POV Female Character, and Female Relationships tags at the AO3, limited to word counts of 1500 or less. Since this project has a relatively quick turnaround time, you may want to refer to the list of authors who have given Blanket Permission to Podfic, so that you can get started recording stories right away! To the Podcurious: A number of prolific podficcers have gotten their start by contributing to previous years of this anthology. If you have ever thought you might like to create podfic, this is a really great starting place. It's low pressure, you'll get a lot of listeners, you're contributing to a cool fanwork that celebrates our love for female characters, and it's not too intense of a spotlight, because your piece is in the company of many other voices. To Everyone: Feel free to comment with links to other fests or specific works that you think would be a good fit for this anthology. Additionally, we are looking for beta listeners who can absolutely commit to at LEAST two hours of beta listening between February 15th and 18th. Please let us know if you'd be available and interested; we'd be very grateful! To Authors: We've had some awesome authors get involved in the past, in pod_together style, to create short female-centric pieces for the anthology in collaboration with podficcers. If you’re an author who’s interested and is seeking podficcers to work with, feel free to comment below. Podficcers who would like this sort of collaboration, please reply directly to the authors. Below the cut is important information on what we're looking for with these podfics and how they should be submitted. Europodfriends: a European meet for podfic fans and podfic-adjacent people! If you create podfic, listen to podfic, write for challenges such as pod_together, make cover art for podfic, or anything else to do with creating or enjoying podfic, you are welcome to join us! This year's meet will be held in Berlin, Germany, November 1st - 3rd. We're currently at the stage of planning our budget. If you would like to come, please fill out this form to let us know about your budget. Don't worry if you can't afford it/would need help to be able to afford the trip - we have options for that as well! We realize is quite early for a lot of people, so don't worry if you can't commit to staying in the Europodfriends accommodation yet - you'll still be able to attend if you find your own, separate accommodation, and there may be extra spaces available in the main accommodation later on! We'll be closing the budget survey on the 31st of January, which is one week from now, so make sure to fill it out until then! If you can't commit yet for sure but would like to keep abreast of things, you can follow us at europodfriends or europodfriends. Alternatively, you can PM me your email address and I will add you to our mailing list! If you have any questions, feel free to contact us and we will do our best to answer! We realize is quite early for a lot of people, so don't worry if you can't commit to staying in the Europodfriends accommodation yet - you'll still be able to attend if you find your own, separate accommodation! We'll be closing the budget survey on the 31st of January, so make sure to fill it out until then! If you can't commit yet for sure but would like to keep abreast of things, you can follow us at europodfriends or europodfriends. Alternatively, you can PM me your email address and I will add you to our mailing list! SPN and SPN RPF podfic gift exchange! We are planning a meetup for podficcers and podfic-adjacent fandom in Germany in late summer/autumn 2018! This form is to gauge interest & help us figure out an exact date + place. If you think you might be interested in coming, let us know by filling out the form! For updates you can follow us on Twitter at europodfriends, though we will also be sending updates by email! Welcome, friends, to year EIGHT of the Ladies Podfic Anthology! As before, we'll be collecting short lady-centric podfics by different readers in different fandoms to release as an anthology and as a collection of individual files. The submission deadline is February 7th, and we will post on February 21st. The theme for this year's anthology is awakening. It's optional—all podfics are welcome as long as they follow the rules laid out in the Submission Guidelines—but feel free to let it inspire you if you'd like. We are lowering the limit of podfics an individual reader can include in the anthology from 8 to 5. Readers are still allowed to submit as many podfics as they want to the spreadsheet and the AO3 collection. We are slightly adjusting the required information spoken at the beginning of each podfic. Previously, it included "by [author]." This has been adjusted to "written by [author]." If you are not familiar with this project, you can see the previous seven anthologies here, here, here, here, here, here, and here. To Everyone: Feel free to comment with links to other fests or specific works that you think would be a good fit for this anthology. Additionally, we are looking for beta listeners who can absolutely commit to at LEAST two hours of beta listening between February 8th and 11th. Please let us know if you'd be available and interested; we'd be very grateful! Here’s how it works: Person A (your friendly neighbourhood mod) makes a podfic. It becomes the prompt for Person B. Person B’s podfic becomes a prompt for Person C’s podfic. And down the line we go until everyone’s had a turn. Using a podfic as a prompt means that each podiccer will pick at least one key element from their prompt podfic and use it in their work. A key element could be, but isn’t limited to: fandom, character, ship, trope, format (dialogue-only, epistolary, etc) or podficcing style (SFX, music, accents, etc). Think of “key element” as something about the podfic that you’d talk about in a rec. Want to know more? Yeah you do. Hi, all readers! hp_podfic_fest is back for another round! All readers are welcome, no matter the skill level, and all Harry Potter podfics are welcome, no matter the pairing, genre, content, or length! The only stipulations are that the fic cannot have been previously recorded and that it has something to do with Harry Potter characters, settings, or plot. Please go HERE to sign-up. Entries are due on September 4th, so that's three full months to record a fic or two or more! Please consider signing up. We'd love to have some new participants! Due to the difficulty in managing the challenge in multiple places at once and in recognition of recent mass exodus from LiveJournal, the challenge will only be operating on Dreamwidth going forward. My apologies to those of you who may be disappointed in this change. The Epic Podfic Big Bang will not be running this year. It's back to just the regular Podfic Big Bang with the usual requirement of 10,000 words. But that doesn't mean you can't shoot for an epic word count yourself! Since we'll be posting in October (my favorite time of the year), I've made the executive decision to name all things Autumn as the optional theme for the year. Behold my cosmic modly powers! Bring on the fallen leaves, harvest moon, pumpkin spice, and Halloween shenanigans. Interpret the theme as broadly or narrowly as you please or ignore it entirely. Join the podficbigbang today! Sign-ups are open. Posting begins October 15, 2017. We will no longer post on the final day of halfamoon. Instead, we will post on the final day of February. Our submission deadline will be February 20th. For the first time this year, we will have a theme. The theme is resistance. It's optional—all podfics are welcome as long as they follow the rules laid out in the Submission Guidelines—but feel free to let it inspire you if you'd like. If you are not familiar with this project, you can see the previous six anthologies here, here, here, here, here, and here. Since this project has a quick turnaround time, you may want to refer to the list of authors who have given Blanket Permission to Podfic, so that you can get started recording stories right away! To Everyone: Feel free to comment with links to other fests or specific works that you think would be a good fit for this anthology. Additionally, we are looking for beta listeners who can absolutely commit to at LEAST two hours of beta listening between February 21st and 23rd. Please let us know if you'd be available and interested; we'd be very grateful! To Authors: It would be totally awesome if some authors wanted to get involved, in pod_together style, to create short female-centric pieces for the anthology in collaboration with podficcers. If you’re an author who’s interested, please comment below. Podficcers who would like this sort of collaboration, please reply directly to the authors. Yay! HP Podfic Fest 2016 has finished its first week of posting, so here's the wrap-up. Click on the fic name to go to the podfic post for downloading and live streaming options. And there's still two more weeks of awesome podfics to go! You have a month to work on your fic. 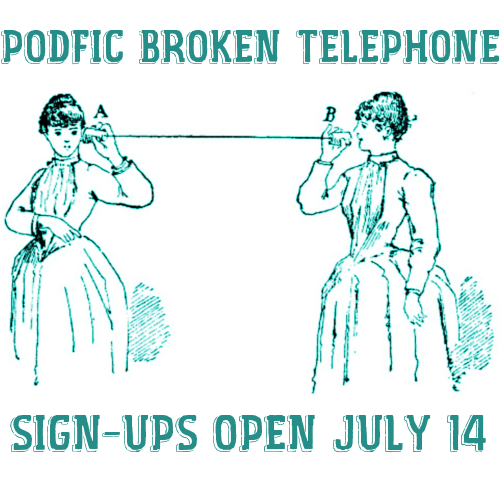 Podfics are due on June 6th. There's still a week left to sign-up for this year's HP Podfic Fest. We could use a lot more podficcers. Any HP fic (not previously recorded), any pairing or gen, any rating. Please come join us! sylvaine - Out of the Auditary is live! sylvaine - Podfic Fest: Out of the Auditary - deadline fast approaching! applegeuse - SPN and SPN RPF podfic gift exchange! sylvaine - European Podfic meetup! starduchess - last day for sign-ups!